Notice: Please read our FS2004 (FS9) Limited Support Notice before purchasing this product. DreamFleet has designed their 727 to be representative of the majority of 727s that are / were in service throughout the world. The 727 is a relatively "basic" aircraft when compared to newer aircraft in service today, and many of the automated features found on newer aircraft are not found on the 727. It is truly an airplane for pilots, not systems programmers. Sharpen up your flying skills, get out your paper charts, and be prepared for some real jet flying with the 727! 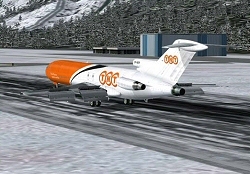 Greatest Airliners: 727 is the first FS add-on aircraft to feature Reality XP color weather radar as standard equipment. The 727 comes equipped with a special version of Reality XP's WX500 radar, appearing as the Bendix unit installed in many real 727s. The cost of this radar if purchased separately would be $24.95, yet the entire 727 costs only $34.95 for the download version. Now, that's value! Visit the dedicated Greatest Airliners: 727 Web Site! DreamFleet has set up a special web site dedicated to their Greatest Airliners: 727. 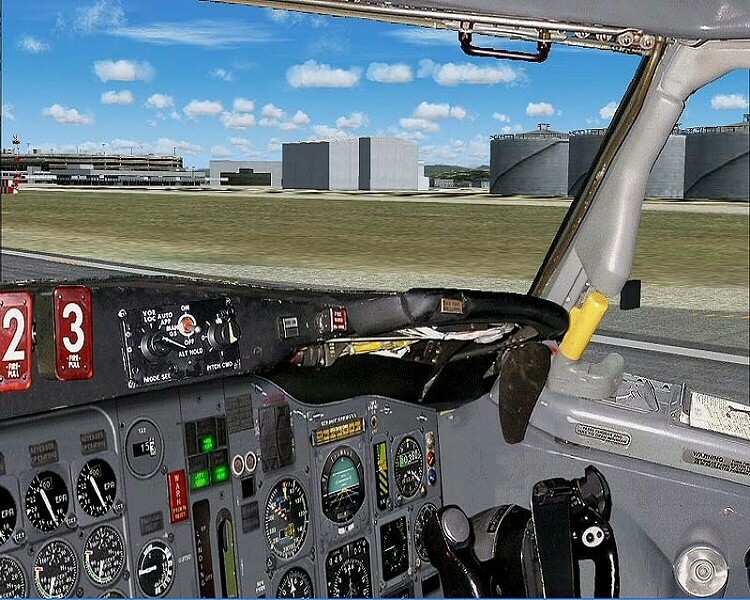 Here you will be able to get the latest information and news on the product, see many additional screenshots not shown here, download product videos, retrieve accessory downloads, get technical support, and discuss the 727 with other virtual 727 pilots. Aircraft Models: Four models are included. Both the 727-100 and 727-200 versions are available in both passenger and freight configurations. These models appear without any winglets or hush kits, as these items were rarely seen during most of the life span of the 727. The models were created in Gmax®, and feature full moving parts, reflective textures and dynamic shine. The aircraft and virtual cockpit were modeled by Paul Springthorpe, a former 727 first officer (now flying the 757), with technical assistance provided by Stan Winke, who is an experienced 727 mechanic / technician. Moving Parts: Landing gear with detailed gear bay. 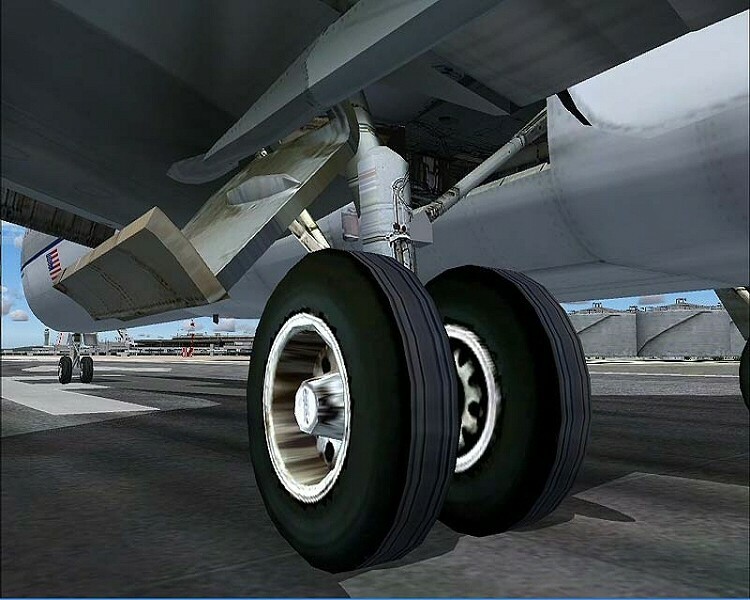 Rotating wheels, and turning nose wheel. Triple slotted flaps. Leading edge flaps and slats. Spoilers. Cargo doors with detailed cargo bay interior. Passenger doors with detailed interior entrance lobby. Rear airstairs. Aircraft Textures: All textures are photorealistic, and are available in high quality 32-bit, or compressed DXT3 format, to best suit the performance capabilities of your computer. 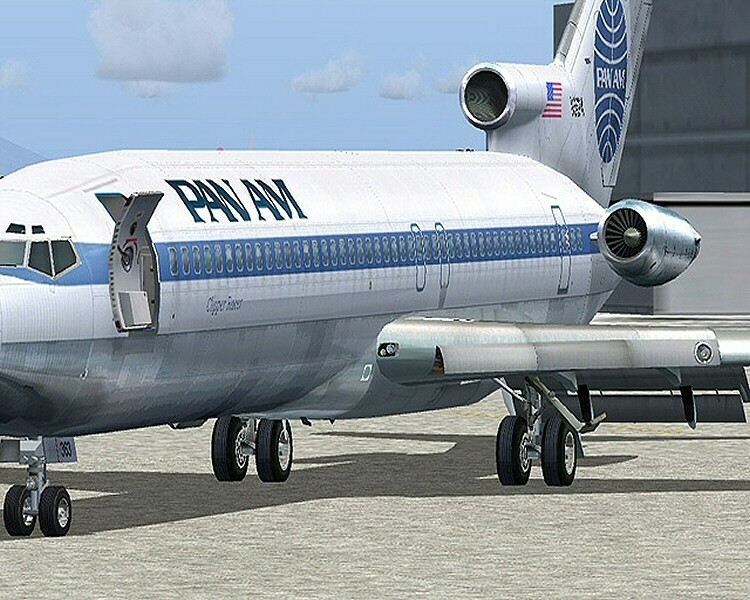 The base textures were created by Rui Cristina, while airline liveries were created by Paul Golding, the 727's lead designer, and Nick Jacobs, the 727's programmer. Airline Liveries & Text-o-Matic: In addition to the numerous airline liveries included with the product, you can create your own airline liveries using our free texture template. Your completed template is then processed with the included Text-o-Matic, Flight One Software's unique texture and aircraft creation utility. Using your completed texture template and "T-o-M", with just a few mouse clicks and a wait of under a minute, you'll have a brand new aircraft, sporting your new livery, ready to fly! 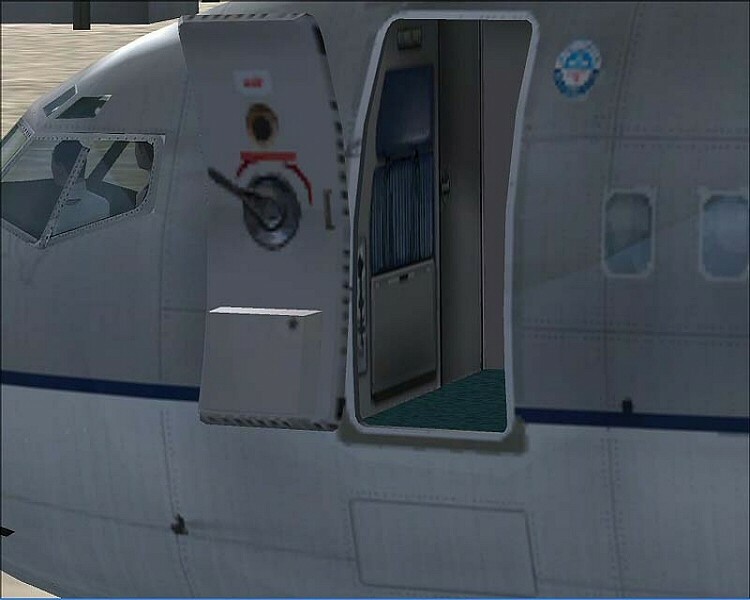 3D Wing Views with full moving parts: You can view the wings right through a photographic image of the real aircraft's window frame, just as a passenger would. 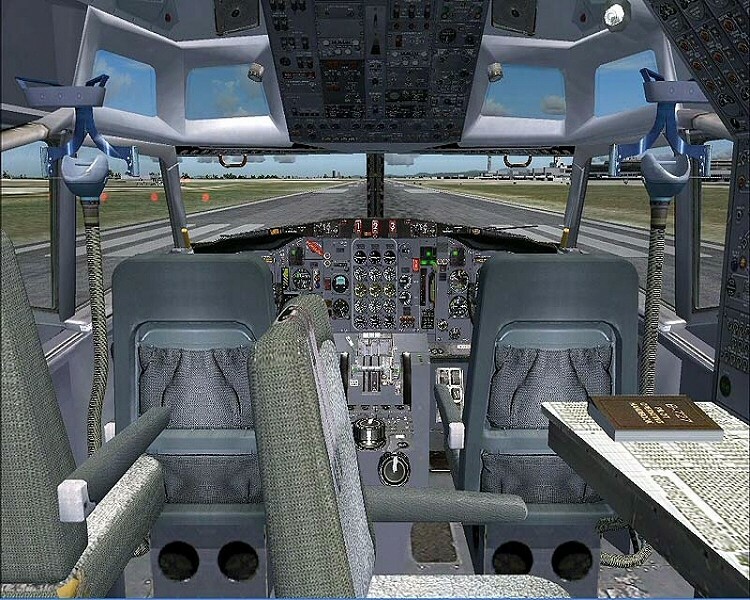 Virtual Cockpit Features: The VC is extremely well detailed, and is textured using real photographs, not hand drawn or rendered artwork. It features clickable gauges throughout, and two levels of cockpit night lighting. Sounds: All sounds featured in the 727 were recorded from the real aircraft, including engine sounds and various cockpit sounds. These sounds were then expertly processed by one of the leading Flight Simulation sound designers, Mike Hambly. The end result is a realistic audible environment can can only be exceeded by sitting in the real aircraft. Full screen Main Instrument Panel: The 2D panel is designed from the captain's seat alone, and features 100% accurate pilot's perspective, and large, easy-to-read gauges. Full screen Flight Engineer's Panel: The FE panels (upper and lower) were designed from the perspective of the flight engineer, thus you are seeing them as the flight engineer would, looking straight on. Every switch, dial, and knob is clearly readable. Full screen Overhead Panel: Complete and fully functional. The overhead appears in full view, flat on your monitor, as though you tilted your head back to view it. All overhead controls appear in this one view. Additional Panel Views: These views include view windows for the Engine Gauges, Gear and Flaps, Throttle Quadrant, Center Stand, APU, Standby Compass, GPS and Autopilot. These view windows pop-up neatly over the Main Instrument Panel, so you can make adjustments while keeping your eyes on the airway ahead. Night Lighting: Our most comprehensive night lighting yet features separately switchable panel flood lighting and gauge night lighting. 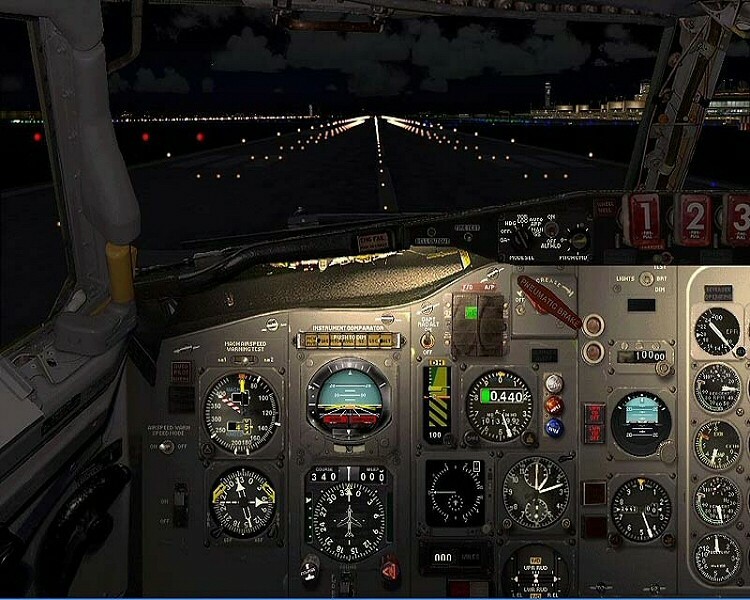 This lighting appears as it actually does on the real aircraft, and confirmed by real 727 pilots, not as how web photos or the imagination would lead you to believe it appears. Interior Cockpit Views: As is standard with all DreamFleet products, we include not only a 3D Virtual Cockpit, but 8 complete 2D cockpit interior views. The choice is yours as to how you wish to look around the cockpit, 2D or 3D view. 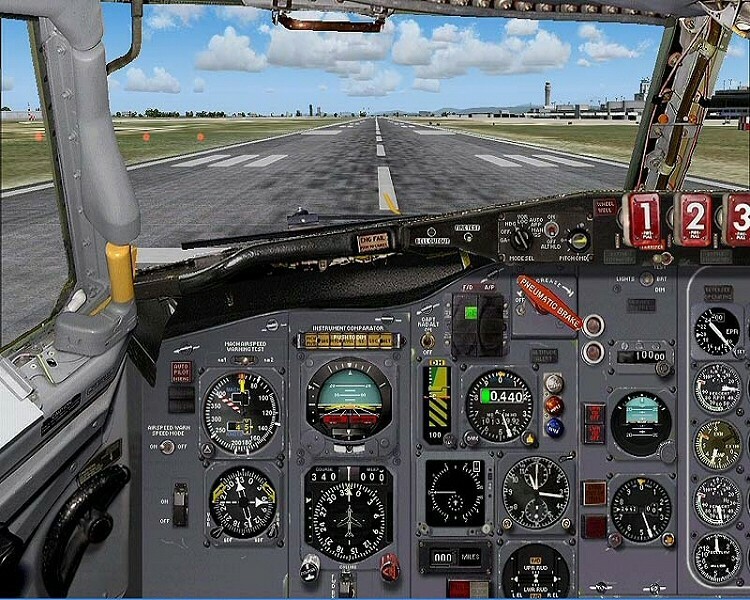 General: Authentically designed gauges created from actual 727 cockpit photographs and accurately brought to life with reference to not 1, but 3 different 727 flight manuals and checked and verified by two 727 pilots. You'd be amazed at what different airlines include or omit from their manuals! Aural: Captain and First Officer verbal interaction/communication is available in a number of different international accents and/or languages. TCAS: Out of respect for what is required on 727s today, we have included an authentically reproduced Honeywell TCAS with test mode, range selector, aural and visual traffic advices and warnings with all targets correctly represented in the TCAS/EVSI gauge on the main panel. Autopilot: Extremely accurate representations of the Sperry SP50 Autopilot and Flight Director. 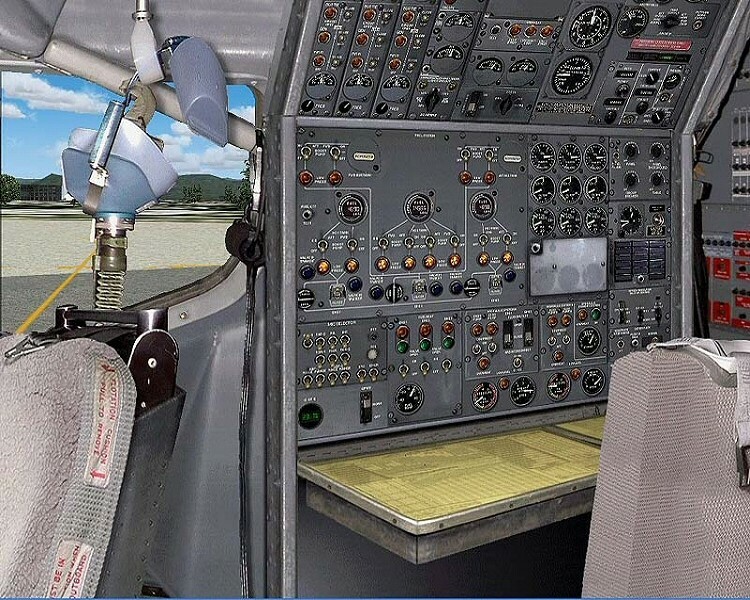 EFIS: While the majority of 727s were equipped with mechanical Flight Directors and Horizontal Situation indicators, we have also included a version of the panel that replaces these older instruments with a modern Electronic Flight Instrument System (EFIS). Thus your mechanical FD and HSI are replaced with the familiar "glass tubes" that are seen on more modern aircraft. The EFIS is our our one concession to some of the modifications made to some 727s in later years. 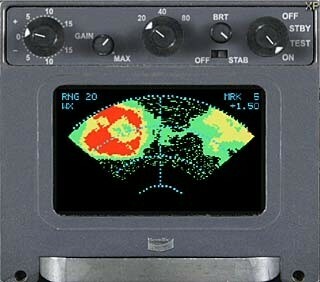 Weather Radar: This is a color Bendix unit, one found in later versions of the 727 and similar aircraft. It is based on the highly popular award winning Reality XP "WX500" weather radar. If you purchased the Reality XP WX500 radar as a stand alone product, it alone would cost $24.95! FMC: Sorry, but the vast majority of 727s were never fitted with this modern convenience, and neither is ours. You'll need to do as the real pilots do, and grab those paper charts, and sharpen those flying skills when a SID, STAR or Hold is called for. 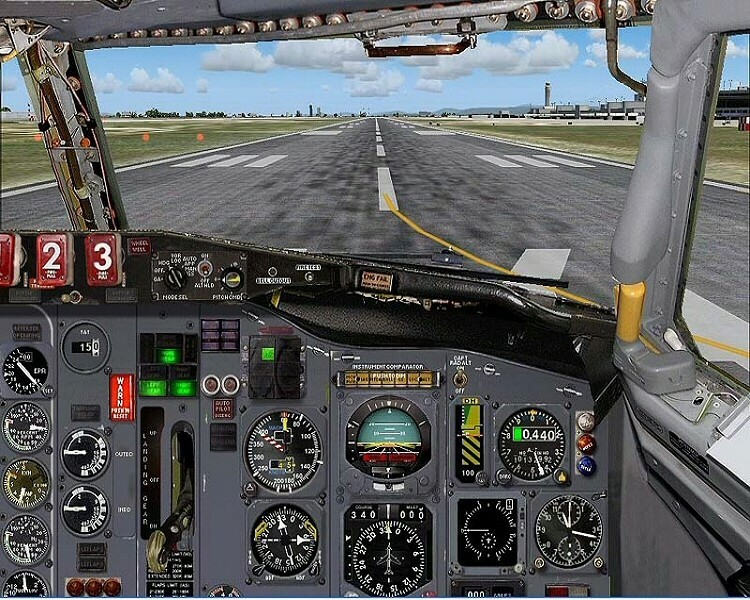 Most 727 navigation in the real world is done using VORs. May we also add that it is not necessary to have an FMC when the above mentioned EFIS is installed in an aircraft. LNAV & VNAV: Not available- you want realism, don't you? Just use your skill, charts, even the autopilot to help if you wish, and soon your flying skills will be so sharp that you'll wonder why you ever turned those functions on in the more modern aircraft you fly! Autoland: The real 727 never had it, and neither does ours. Punch off the Autopilot at 1,000', and tackle that crosswind with your own two hands, just as the real 727 pilots do. Autothrottle: Yet another modern convenience not on the real 727, and not on ours either. With the 727 you'll fully understand the term "a fist full of throttles". See if you can manage speed manually while flying a procedure as well as real 727 pilots do! Text-o-Matic: In addition to the numerous airline liveries included with the product, you can create your own airline liveries using our free texture template. Your completed template is then processed with the included Text-o-Matic, Flight One Software's unique texture and aircraft creation utility. Using your completed texture template and "T-o-M", with just a few mouse clicks and a wait of under a minute, you'll have a brand new aircraft, sporting your new livery, ready to fly! Config-o-Matic: Set weight and balance and control other features of the 727 with this handy utility. The E-Commerce enabled download executable is about 126 MB in size. The purchase screen will appear when you run the executable. The servers do support Resume, however we do not recommend certain download managers because they can sometimes corrupt large downloads. Note: This is release 2 of the product with the new models released on 12/30/05. Get Livery Pack 1! This package of liveries adds up to 17 new repaints to the product. These free liveries need to be installed with Text-o-Matic after you run the setup below. You can always get the latest Text-o-Matic here. Get Livery Pack 2! This package of liveries add an additional 17 new repaints to the product (Livery Pack 1 and 2 totals 34 liveries). These liveries require Text-o-Matic, as described just above. Windows XP Recommended - Windows XP is the official operating system that is supported for use with the Greatest Airliners: 727. It may work with other Microsoft operating systems, however this is not supported by Flight One.